I find myself talking about Twitter quite a lot. I’m not the only one. The behaviours that Twitter has madeÂ more visible are tremendously interesting. Itâ€™s basically blogging reduced to what the Russian linguist Mikhail Bakhtin called â€œthe phatic function.â€ Like saying â€œwhatâ€™s up?â€ as you pass someone in the hall when you have no intention of finding out what is actually up, the phatic function is communication simply to indicate that communication can occur. It made me think of the light, low-content text message circles Mizuko Ito described existing among Japanese teens – itâ€™s not so important what gets said as that itâ€™s nice to stay in contact with people. These light exchanges typify the kind of communication that arises among people who are saturated with other forms of communication. I came across this research when I was doing my Masters a few years back and it’s continued to fascinate me (and yes, I’ve been thinking about it quite a bit whilst considering, and defending, Twitter). intimate sharing / presence â€“ sharing intimate photos on the handset when talking face to face with people. Photos that fall into this category would be photos of partners, family, pets, etc. However, this can also be very every day stuffâ€¦ eg. what Iâ€™m having for dinner. It is sharing ongoing mundane visual information with intimates, creating a sense of presence in other peoples lives without needing to talk or be physically present. I think that the simplicity of Twitter is key to it’s success. 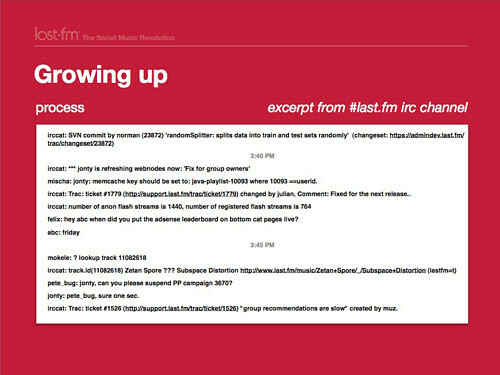 The messages must be short and they’re simple text.Â I’m starting to think that the level of stimulation is key to the success of these ‘osmotic’ communications (as theÂ guys from LastFM referred to the IRC channel they use internally). We’ve been trialling some options for a similar kind of osmotic backchannel to use at Flow. One of the first things we roadtested was Skype Public Chat. Amongst some other problems (including that there is no Mac version of the current release which supports the Public Chat function), it seemed that the flashing and noises and animated emoticons were too stimulating… the conversation wanted to leap to the front of the screen continually demanded attention. IRC on the other hand (ah, what a flash back to open up mIRC again after all these years!) reminds me a lot more of Twitter. There’s none of the flashing and animating and carrying on. The humour is in the text (it took about 30 seconds for the first trout related comment to emerge… old habits…). To me, IRC seems to be a much more effective tool for a back channel, for supporting this osmotic communication within a company. (Assuming we can reduce the barrier to ‘log on’… it’s not a friendly experience for not-geeks). What does seems clear is that, for a lot of people, this ambient intimacy adds value to people’s lives and their relationships with others. I think we can expect to see a lot more of it… but if I was building a tool to support it, I’d be keeping it very simple and unobtrusive. Osmosis is one thing, hyper-stimulation is quite another! â€œAmbient intimacyâ€ ? A link on a website has brought me here. As I read about this new online jargon I realized that its interpretation is subject to how open you are to get people to know you. Drawing a parallel with face-to-face interactions, â€œambientâ€ would be the subway car, the elevator, the waiting room at the doctorâ€™s, the coffee shop, the snack bar or any public place you stop at and â€œintimacyâ€ would be engaging in a conversation about yourself and your views with a stranger in a voice loud enough so others could hear and possibly join in. How often do we do that ? Me, personally ? Never. So I can fairly claim that â€œambient intimacyâ€ assumes a new dimension in our on-line world when we are away from other, behind our computers or mobile phones (as I am now). For me, it seems to bring me the comfort I would not otherwise have to walk away from any discussion any time I feel like, which, come to think of it, appears to contradict the very concept of intimacy (that, by the way, implies â€œclosenessâ€, â€œproximityâ€). Since such â€œclosenessâ€ can only materialize in face-to-face encounters, the bottom line is that maybe the most precise word for it would have been â€œambient small talkâ€.